The 70's continues to be a huge trend into the fall and while I love boho dresses, it's getting a bit chillier around here these days. I've had to get a bit more creative with how to incorporate those 70's vibes into my looks while layering up and keeping warm - boho felt hats and flare jeans have become my two go-to 70's style fall items. The trick to wearing flared jeans is to really exaggerate that elongated leg. I love a high rise pair that just skim the floor. A lot of times, if something doesn't fit me just right, I can fake it: belt it, roll the sleeves, cuff the ankles, etc, but I think when it comes to flare jeans, it is most important that they fit properly which may mean having to bring in a tailor. I know, I know, but it'll be worth it when your jeans fit you to a T.
Be sure when you visit the tailor, you bring along the shoes that you will be wearing with the jeans. To continue that exaggerated leg length idea, I think a heel or platform style is totally necessary. During the summer, I loved my flares with wedges and now I wear them with my heeled booties. 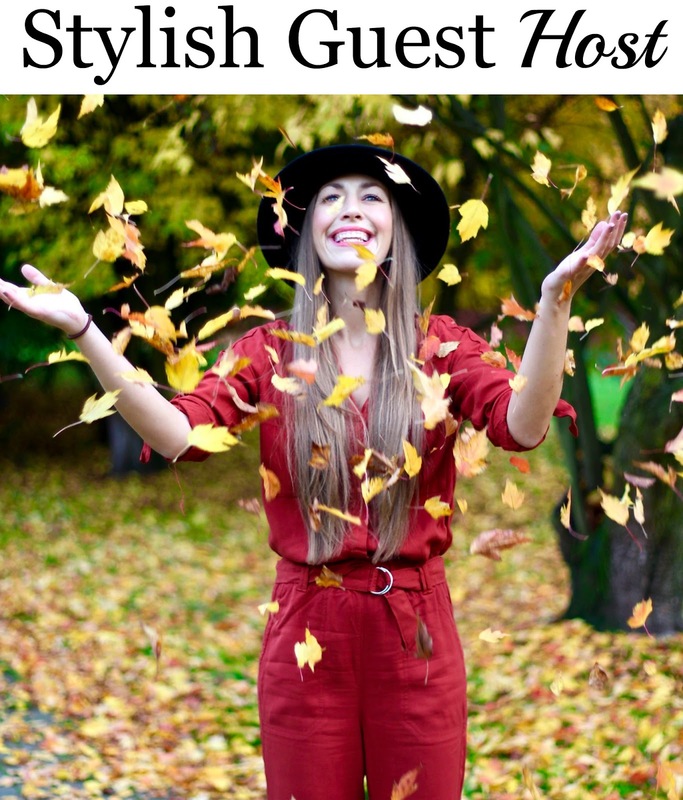 Meet our co-host for this week's Start The Week Stylish linkup: Alexa from Fabes Fashion. Originally from Germany, Alexa is now a California based styled blogger, who loves Starbucks, traveling & Blake Lively (who doesn't?)! Be sure to stop by her blog this week and say hello! We loved the way Chelsea from She Said, He Said and Brittany from A Lawyer Lookbook styled the color burgundy last week. I love how you went with a lighter color palette for this look - so pretty with the light washed denim and light grey scarf! And those are the perfect pair of flares! Just because the weather is getting colder, doesn't mean I'm giving up my light shades! You look utterly adorbs from top to toe! Come join the RAY-BAN GIVEAWAY I am hosting at the blog for SUNGLASSES SHOP from Nov. 16-22! Thank you so much! I will be sure to check it out! Love that flares are in again! Super cute jeans! These flares look perfect on you. I love how you styled them with the white t-shirt, scarf and hat. You look great. Thanks! These jeans are perfect, they don't need a ton to look great! Those light wash flares are so pretty on you, especially paired with that knit scarf! Michelle, what a lovely look on you, the hat and added clutch provide the right touches. You look amazing! I need those flares, one of my favorite styles to wear! Thank you So much for the feature!! Made my day. They fit perfectly without any tailoring! Definitely worth trying! 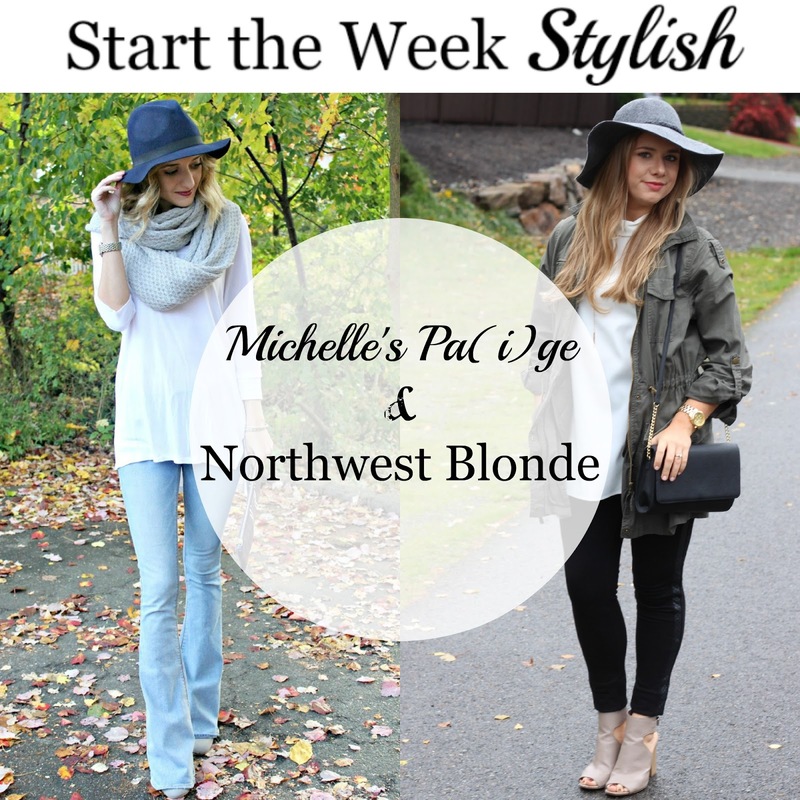 We looooved your look from last week! These flares were made for you! Such a babe! It is so important to visit a tailor when it comes to flares, they have to be the perfect length! Your pair is perfection! Totally! I got lucky with this pair - a perfect fit! Love the flare jeans, so perfect on you and for this look! The flared denim and clutch are such stunning pieces! I love the light jeans and top paired with the navy clutch and hat. Beautiful. Thank you! I used to love C Wonder for pouches like this one! I need to find another great place to get clutches from! These flares look great on you and are perfectly paired with the hat and scarf! Thank you for the great tailoring tips and for sharing such a cute look! I especially love your hat! You can't got wrong channeling the 70's and rocking a killer pair of flares which you certainly did! Have a wonderful week ahead! Thank you! The 70's are one of my favorite trends! You look adorable! Love your flares! I'm a huge advocate of flares anytime of the year - this light wash pair looks so good on you! Me too! I need to get a darker pair for the upcoming winter season! These jeans are amazing on you!! Perfect fall outfit! I am loving those jeans!! such a nice look, love the hat and the sweater! love the scarf with flared jeans! so cute! Those flares look amazing on you! Love the cozy scarf and the hat! Loving the 70's vibe and those flares look amazing on you! The light wash is perfect and I love the hat. Thank you! I love this pair of flares! Could you look any more amazing in those flares?? NO! AMAZING!! I agree with you that flared jeans and floppy or felt hats take an outfit into bohemian territory and that is exactly what I am doing if I want to feel Boho. Your tailor tips are right on. Your booties, clutch and hat are so cute and I own almost identical flare denim from AE.